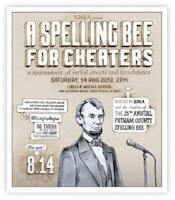 DIY - Cheaters Spelling Bee fundraiser! Teams bore names like “The Dictionators,” “Spells Like Team Spirit,” and “Bad Robots,” and picked one contestant to spell the words, while teammates cheered on their champions. Contestants and teammates included 826LA students and volunteers including some big name celebrities. Many contestants took the easy way out, choosing Cheat Option “Invent a Word” that involved spelling a word of their own invention. Some of these words like broseiden (“a frat brother who has ‘godly control’ of the ocean”) seemed just as hard to spell as the regular words, but the contestants nailed them since they had invented them. Round Two got harder because “Invent a Word” was no longer an option. Instead, contestants asked for “next letter” clues, looked in the dictionary and consulted their teams. It came down to two finalists. No sudden death here; the wining contestant had to correctly spell a new word after the other contestant had failed. Back and forth they went, misspelling in turn words like inspissate (to thicken), apocape (loss of a sound at end of word), astrobleme (a scar on the earth’s surface from a meteor), and cockalorum (a self-important person). Finally the winner correctly spelled hallux (the big toe) for the grand prize of a large dictionary. Second and third prizes were a medium and small size dictionary, respectively. The dictionaries were autographed by the celebrity guests. In all, 826LA raised over $73,000 for its programs. This looks to be an annual event and was fun for everyone. For more information on 826LA, go to www.826LA.org.